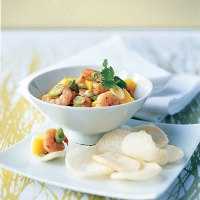 An easy starter of spicy ready-marinated prawns with cooling mango. As an alternative to the prepared prawns, use 300g plain cooked prawns. Place all the ingredients, apart from the coriander, in a bowl and mix well. If not eating immediately, spoon into a well-sealed container and place in the fridge for up to 12 hours. Serve as a starter, garnished with the coriander leaves, with prawn crackers on the side. When transporting, keep this dish cool and place in the fridge as soon as you arrive.